This is really the easiest way to grill salmon and truly my most favorite way to cook and eat it! It really takes no time and the ingredients are simple, fresh and tasty. That’s why I call it No Fuss, No Muss Salmon. You can cook it in the oven if you don’t want to grill. Just bake it in a baking dish at 350 degrees for about 20 minutes depending on the size of the piece of fish. Take a piece of aluminum large enough to hold 1 filet. Put the filet on aluminum and fold up edges (as pictured), making a little tray out of foil. First pat salmon dry with a paper towel and very lightly sprinkle salt and pepper on each filet (it really doesn’t need it, but I use a little bit). Next, spread dijon mustard on the filet with a butter knife (all over the top). Sprinkle a few capers on each–as many or as little as you like, I don’t use a lot; just a few is good. I cut the lemon in 1/2 and then squeeze a little all over each piece (1/2 lemon is good for the 2 pieces) and then I slice very thin slices from the other 1/2 of the lemon and place them right on top of the salmon. 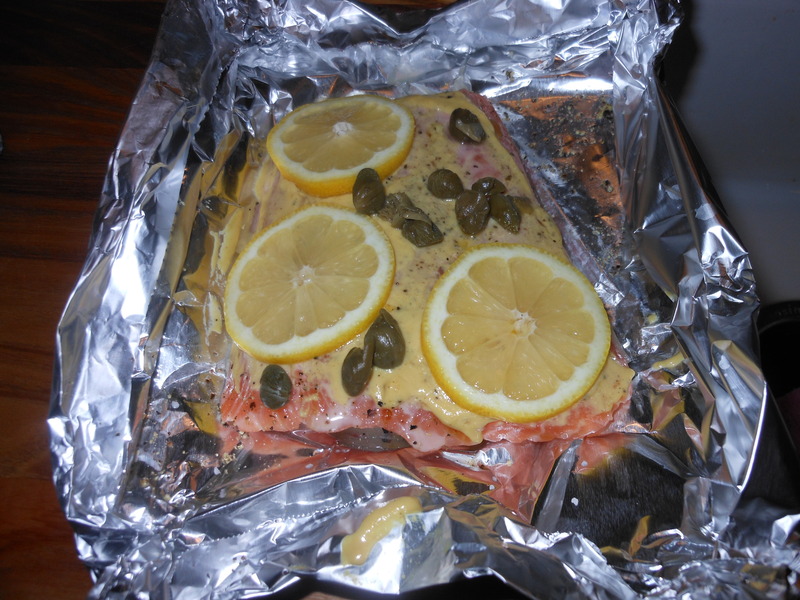 I then place the salmon on a hot grill in aluminum, lower heat to a more moderate heat and cook for about 20 minutes. Next, remove from heat, fold up sides and just let it sit for about 5 minutes. When you open up the aluminum and take the salmon out, it should lift right off the skin but you may have to play with it. The skin is actually very crispy at this point. Salmon should be light pink and flaky. I served this with a beautiful salad, gazpacho and homemade macaroni salad. We sat outside and ate. It was a beautiful night. This entry was posted in seafood and tagged fish, no muss no fuss salmon, Salmon, salmon with dijon and lemon, Seafood. Bookmark the permalink. I love the way you say it’s no fuss. Love how I can throw away the foil after eating the salmon, looks delicious!